Capacity: 1230mah(8.9Wh). D3100 D3200 D3300 D3400 D5100 D5200 D5300 D5500 D5600 P7000 P7100 P7700 P7800. INPUT: AC 100 ~ 240V, 50 ~ 60Hz 0.25A. Absolute Quality Guarantee! Fully Decoded! 1200mAh! Nikon D5300. Nikon Coolpix P7100. Nikon Coolpix P7000. Nikon D5200. Nikon D3200. Nikon D5100. Nikon Coolpix P7700. It is what you would expect from a second hand item after a period of normal use. It is Optically perfect and Fully functional. Or there could be minor dents. It does NOT imply what accessories are included. As new condition. Used a couple of times Due to delivery restrictions on batteries collection only. Brand New Qumox 1030mAh EN-EL14 Battery For Nikon D3100 D3200 D5100 D5200 Coolpix P7000 P7100 P7700 Digital Cameras. 100% Fully Decoded Work As Original Battery. 1030mAh Li-ion 7.4V high quality replacement with 1 years warranty, This Qumox EN-EL14 equivalent battery is manufactured with high quality shell and top grade "A" japan cell to achieve low internal resistance and high capacity battery pack. Our battery installed double IC chip this battery offer 100% safe and secure use with compatible device. It contains no cadmium, lead mercury, and other environmental metal pollutants..
Nikon D600 D610 D750 D800 D810 D7000 D7100 MB-D11 D12. 2x NEW NikonEN-EL14 Batteries. EN-EL14 Battery's Details 100% New High Quality battery. Battery Type Li-Ion. The Tech Shed highly rated Seller fully stocked UK and NI company Thanks for looking at our, LONG LASTING Genuine Nikon EN-EL14a Li-Ion Digital Camera Battery Pack PLEASE NOTE THESE BATTERIES ARE SPLIT FROM ACCESSORY KITS SO DO NOT COME IN ORIGINAL BOX. The Nikon EN-EL14a Battery Pack for Nikon Df, D3100, D3200, D3300,D3400,D3500, D5100, D5200, D5300,D5500,D5600 DLSRs is a rechargeable lithium-Ion battery with high-capacity for long operating life. Brand new genuine Nikon battery split from an accessory kit so supplied with no box. 2x Decoded Battery for Nikon EN-EL14 D3100 D5100 D3200 P7000 P7100 UK. Condition is New. Dispatched with Royal Mail 1st Class. (Also available for EU and AU ). Excellent, genuine item as described. Fine service with genuine parts. Good, quick communication. very very good. and for D40 D40X D60 D3000 & D5000. Likewise for D50 D70 D70s & D100 (Also pictured here). NikonD3100 D3200 D3300 D3400 D5200 D5300. 100% Original and high quality. 1X Genuine Original EN-EL14. For Nikon D, Nikon P7000, P7100, P7700, P7800, D3100, D3200, D3300, D5100, D5200, D5300, D5500. D3100 D3200 D3300 D3400 D5100 D5200 D5300 D5500 D5600 P7000 P7100 P7700 P7800. Nikon Coolpix P7100. Nikon D5200. Nikon Coolpix P7000. Nikon D3200. Nikon D5100. Nikon D3100. 2 Battery Protection Cover. (Use "Ctrl" "F" to search for your model quickly). D3100 D3200 D3300 D3400 D5100 D5200 D5300 D5500 D5600 P7000 P7100 P7700 P7800. INPUT: AC 100 ~ 240V, 50 ~ 60Hz 0.25A. Compatible With. Nikon Coolpix P7100. Nikon Coolpix P7000. Nikon D3200. Nikon D5100. Nikon D3100. Nikon D5200. (Use "Ctrl" "F" to search for your model quickly). Size:(mm): 52x35x19mm. Inov8 EN-EL14 Lithium-Ion Rechargeable Battery Pack for Nikon Cameras. Decoded. Far superior to the cheap imported batteries. Inov8 EN-EL14 Lithium-Ion Battery for Nikon. Better performance in low temperatures. Nikon D5200. Nikon D5100. Nikon D3100. Nikon Coolpix P7000. Nikon Coolpix P7100. Nikon D3200. 2 Battery Protection Cover. Capacity: 1200mAh. Brand new full coded Digital camera..tible with EN-EL14a battery for Nikon. Condition is New. Dispatched with Royal Mail 2nd Class. Fits Nikon Models D3000/3100/3200/3500/5300/5500 & P7000/7800. Nikon Coolpix P7100. Nikon D5200. Nikon Coolpix P7000. Nikon D5100. Nikon D3100. Nikon D3200. Nikon Coolpix P7100. Nikon D5200. Nikon D3200. Nikon D3100. Nikon Coolpix P7000. Nikon D5100. Fits:Nikon D3100, D3200, D3300, D3400, D5100, D5200, D5300, D5500, D5600, CoolPix P7000, P7100, P7700, P7800, Df. 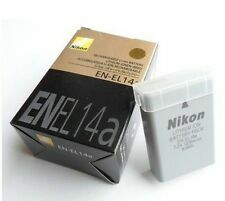 Replaces:Nikon EN-EL14, EN-EL14A. Each battery has a 3-year limited warranty, protecting you whatever happens. Nikon Coolpix P7100. Nikon Coolpix P7000. Nikon D5200. Nikon D3200. Nikon D5100. 2 x Battery Nikon EN-EL14. 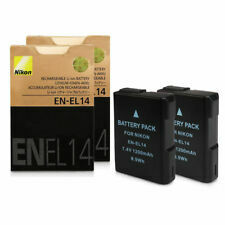 4 x Battery for Nikon EN-EL14. 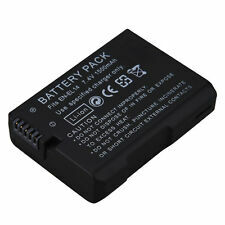 Lithium-Ion 7.4V 52x35x19mm 1200mAh 45g 2 2 Battery For NIKON EN-EL14. NEW AND Genuine Original Nikon EN-EL14 Battery FOR Nikon P7000 D3100 D3200 D5100 Unboxed in baggy. This is our livelihood and we would ask for the opportunity to fix the issues that you have encounter. Nikon Coolpix P7100. Nikon Coolpix P7000. Nikon D5200. Nikon D5100. Nikon D3100. Nikon D3200. Smart LED charging status indicator. 1 MINI USB Cable. Nikon Coolpix P7100. Nikon Coolpix P7000. Nikon D3200. Nikon D5100. Nikon D3100. Nikon D5200. Size:(mm): 52x35x19mm.